A variation of adobo popular in the Bicol region which uses coconut milk. 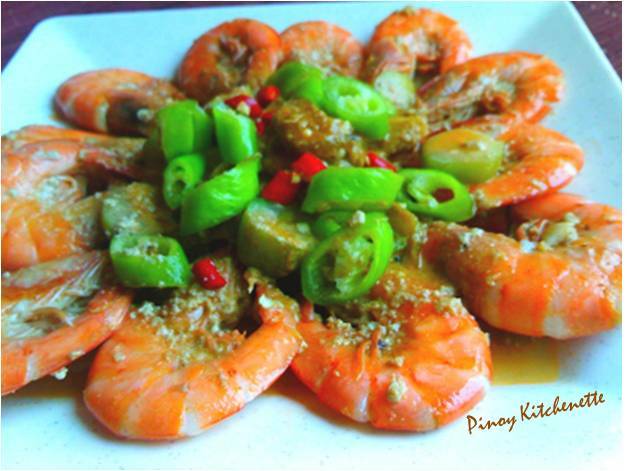 Will let you try not just a coconut shrimp, but shrimps cooked in coconut milk with kamias. Once again, kamias never failed to give this distinct taste in my dish, just a perfect tinge of sourness and not too overpowering for you to still taste the creaminess of coconut and fresh sweetness of shrimps. 1 Combine the Marinade ingredients in a saucepan, place the shrimp in the pan and coat well, then set in the refrigerator to marinate for 1 hour. 2 Remove the shrimp and bring the Marinade to a boil. Cook, uncovered, for 5 minutes. 3 Reduce the heat, add the coconut milk and simmer for 15 minutes to allow the sauce to thicken. Return the shrimp to the pot, stir and bring to a boil. 4 Immediately, remove from the heat and garnish with the fried garlic. Serve hot with the kamias limes on the side.